Japanese encephalitis is a neurologic infection with a broad range of manifestations. It can range from subtle changes in behavior to serious problems, including blindness, ataxia, weakness, and movement disorders. Japanese encephalitis is caused by the Japanese encephalitis virus (JEV), a flavivirus, and is closely related to St. Louis encephalitis and West Nile encephalitis. It occurs primarily in rural areas of Asia (see the image below). Japanese encephalitis is spread through these regions by bites of culicine mosquitoes, most often Culex tritaeniorhynchus. Japanese Encephalitis Virus Geographic Distribution. Photo Courtesy of CDC. In the United States, Japanese encephalitis mostly develops among travelers returning from endemic countries. 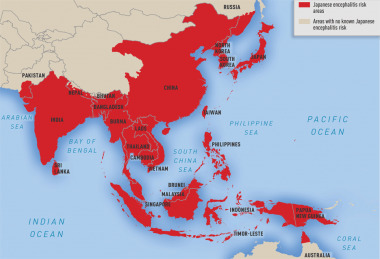 Countries with endemic Japanese encephalitis virus include Malaysia, Philippines, China, Taiwan, Bangladesh, Thailand, India, Japan, Pakistan, and several other countries in the neighboring regions. See the Epidemiology section for more details. Individuals infected with Japanese encephalitis virus have a history of mosquito exposure in an endemic area. Such individuals may present with fever, headache, nausea, diarrhea, vomiting, and/or myalgia, followed by altered mental status, seizures, flaccid paralysis, hyperpneic breathing, extrapyramidal signs, and cranial nerve findings. Japanese encephalitis virus–specific immunoglobulin M (IgM) capture enzyme-linked immunoassay (ELISA) on serum or cerebrospinal fluid (CSF) is the standard diagnostic test for Japanese encephalitis. Virus isolation from clinical specimens is difficult because viremia in humans is transient and low level. Lumbar puncture is performed to obtain CSF and to rule out other potential etiologies of encephalitis. The opening pressure may be high, CSF protein level may be high, and CSF glucose level is often normal. Potential bloodwork findings may include mild leukocytosis and hyponatremia. MRI and CT scanning of the brain may show bilateral thalamic lesions with hemorrhage. Electroencephalography (EEG) may show diffuse slowing. Differential diagnoses include West Nile virus encephalitis, St. Louis encephalitis, Murray Valley encephalitis, herpes simplex virus encephalitis, dengue fever, Nipah virus infection, California encephalitis, pyogenic focal brain abscess, tuberculous meningitis, Rocky Mountain spotted fever, fungal infections, central nervous system (CNS) lupus, CNS tumors, and cerebrovascular accident (CVA). No antiviral agent is effective against Japanese encephalitis virus. Care is supportive, including management of intracranial pressure, if needed, airway protection, and seizure control. Japanese encephalitis vaccine is available. Measures to prevent mosquito bites and to decrease the mosquito population and viral spread should be implemented. Mortality rates associated with Japanese encephalitis may exceed 35% in less-developed countries. The prognosis varies depending on several factors. Most cases improve between 6 months and 12 months. Approximately 33%-50% of survivors have major neurologic sequelae. Good prognostic factors include high CSF concentration of neutralizing antibodies. Poor prognostic factors include low Glasgow coma scale (GCS), hyponatremia, and age younger than 10 years. See Prognosis for more detail. In 1934, a Japanese scientist, Hayashi, inoculated monkey brains with the virus, reproducing the disease. This virus was named Japanese B encephalitis virus, after its association with the summer type (or type B) encephalitis. Japanese encephalitis virus is transmitted to humans via the bite of infected Culex mosquitoes, especially C tritaeniorhynchus. Other Culex vectors include Culexvishnui (India), Culexgelidus, and Culexfuscocephala (Thailand, India, Malaysia). They prefer to bite outdoors and are extremely active in the evening and night, when the risk of infection is greatest. Mosquitoes breed in collections of water (typically rice paddies), increasing the risk of infection in rural areas. Aedes mosquitoes have also been implicated in Japanese encephalitis virus infection. Humans are incidental and dead-end hosts, producing a low-grade, short-term viremia. Therefore, mosquitoes are unable to transmit the virus from one person to another. Pigs and aquatic birds (eg, egrets, herons) serve as amplifying hosts. They develop persistent, high-grade viremia and represent the main vertebrate hosts and the principal reservoir for the virus. Cattle develop only relatively low-grade viremia or none at all; these animals are not part of the natural transmission cycle of the virus. Horses and piglets (not adult pigs) may develop clinical illness with a symptom spectrum similar to that in humans (eg, fever, locomotion difficulty, confusion). Japanese encephalitis virus genotype I isolates have been identified in northern Thailand, Cambodia, and Korea. Japanese encephalitis virus genotype II isolates have been identified in southern Thailand, Malaysia, Indonesia and Northern Australia. Japanese encephalitis virus genotype III isolates have been identified in Japan, China, Taiwan, Philippines, and the Asian subcontinent, including India and Nepal. Japanese encephalitis virus genotype IV isolates have been identified in Indonesia. Subsequently, viremia develops, leading to inflammatory changes in the heart, lungs, liver, and reticuloendothelial system. Most infections are cleared before the virus can invade the CNS, leading to subclinical disease. Subclinical or mild forms of Japanese encephalitis resolve in a few days if the CNS is not involved. In such cases, the infection may not produce symptoms and therefore remains undetected. However, given the neurotropic character of Japanese encephalitis virus, neurologic invasion can develop, possibly by growth of the virus across vascular endothelial cells, leading to involvement of large areas of the brain, including the thalamus, basal ganglia, brain stem, cerebellum (especially the destruction of the cerebellar Purkinje cells), hippocampus, and cerebral cortex. Persistent infection and congenital transmission may occur. The levels of varying immune response (intrinsic, cellular, humoral) have been characterized. Higher levels of certain cytokines (interferon-alpha, interleukins 6 and 8) have been associated with an increased mortality risk. The types of response implicate impaired T-helper-cell immunity in patients with severe advanced disease. Overall, Japanese encephalitis virus is believed to result in increased CNS pathology because of its direct neurotoxic effects in brain cells and its ability to prevent the development of new cells from neural stem/progenitor cells (NPCs). Japanese encephalitis virus likely represents the first mosquito-transmitted viral pathogen to affect neural stem cells. These cells can serve important roles in injury recovery; consequently, Japanese encephalitis–induced disruption of neural stem cell growth may be particularly important to further morbidity and mortality. Serologic evidence of Japanese encephalitis virus infection in endemic rural areas is found in nearly all inhabitants by early adulthood. Most symptomatic infections in endemic areas occur in young children (aged 2-10 years) and elderly people. In nonendemic areas, Japanese encephalitis virus infection has no age predilection. In the United States, Japanese encephalitis develops mostly among military personnel, expatriates, and, rarely, returning travelers. Before 1973, more than 300 cases of Japanese encephalitis were reported among US military personnel or their family members. From 1973-2013, 68 cases were reported to the Center for Disease Control and Prevention (CDC) among travelers and expatriates from nonendemic countries, 19 cases of which of which were from the United States; 8 cases occurred after 1992, when the Japanese encephalitis vaccine was made available in the United States. The approximate risk estimate is less than 0.2 cases per 1 million US travelers. Outbreaks are rare in the US territories of Guam and Saipan. Areas of seasonal and year-round transmission of Japanese encephalitis virus are shown in the map below. Japanese encephalitis, 2006. Courtesy of the WHO. Two outbreaks of Japanese encephalitis have occurred in Australia, the first in 1995 on islands in the Torres Strait  and the second in 1998 on the Cape York Peninsula. In addition, in 2004, one Japanese encephalitis virus isolate was detected from a pool of Culex mosquitoes trapped on the Cape York Peninsula. Overall, as with other emerging pathogens, many of which are zoonotic viruses, a very complicated interplay of ecologic, climatic, environmental, and human behavioral factors have resulted in widespread distribution of Japanese encephalitis virus. Even mosquitoes pushed along by wind currents have been considered contributory to viral spread, eg, from Papua New Guinea to the Torres Strait islands and the Australian mainland. However, no evidence shows that Japanese encephalitis epidemics are likely part of postflooding infectious disease outbreaks. The prognosis of symptomatic Japanese encephalitis virus infection varies. Two factors that portend a good prognosis include high concentrations of neutralizing antibodies in the cerebrospinal fluid (CSF) and high levels of Japanese encephalitis virus immunoglobulin G (IgG) in the CSF. Proven risk factors for mortality include demonstration of virus in the CSF, low levels of IgG/IgM in the CSF or serum, and a decreased sensorium. Approximately 33%-50% of survivors of symptomatic disease have major neurologic sequelae at 1 year, including seizure disorders, motor or cranial nerve paresis, or movement disorders. At 5 years, nearly 75% of such patients score lower on standardized tests than control subjects. Japanese encephalitis virus infection in the first or second trimester of pregnancy may lead to fetal death. Infection in the third trimester, although not systematically evaluated, appears to be associated with a normal fetal outcome. Previous dengue infection may be associated with decreased morbidity and mortality rates, possibly due to partial protection of cross-reacting antiflaviviral antibodies. Lobigs M, Diamond M. Feasibility of cross-protective vaccination against flaviviruses of the Japanese encephalitis serocomplex. Expert Rev Vaccines. 2012 Feb. 11(2):177-87. [Medline]. [Full Text]. Solomon T, Ni H, Beasley DW, Ekkelenkamp M, Cardosa MJ, Barrett AD. Origin and Evolution of Japanese Encephalitis Virus in Southeast Asia. J Virol. 2003 Mar. 77(5):3091-8. [Medline]. [Full Text]. Takhampunya R, Kim HC, Tippayachai B, Kengluecha A, Klein TA, Lee WJ, et al. Emergence of Japanese encephalitis virus genotype V in the Republic of Korea. Virol J. 2011 Sep 23. 8:449:[Medline]. [Full Text]. Unni SK, Ružek D, Chhatbar C, Mishra R, Johri MK, Singh SK. Japanese encephalitis virus: from genome to infectome. Microbes Infect. 2011 Apr. 13(4):312-21. [Medline]. Thongtan T, Cheepsunthorn P, Chaiworakul V, Rattanarungsan C, Wikan N, Smith DR. Highly permissive infection of microglial cells by Japanese encephalitis virus: a possible role as a viral reservoir. Microbes Infect. 2010 Jan. 12(1):37-45. [Medline]. Shukla V, Shakya AK, Shukla M, Kumari N, Krishnani N, Dhole TN, et al. Circulating levels of matrix metalloproteinases and tissue inhibitors of matrix metalloproteinases during Japanese encephalitis virus infection. Virusdisease. 2016 Mar. 27(1):63-76. [Medline]. Hills SL, Stoltey J, Martinez D, Kim P, Sheriff H, Zangeneh A, et al. Journal of Travel Medicine. 2014 Sep-Oct. 21(5):310-313. [Full Text]. Hills SL, Griggs AC, Fischer M. Japanese encephalitis in travelers from non-endemic countries, 1973-2008. Am J Trop Med Hyg. 2010 May. 82(5):930-6. [Medline]. [Full Text]. Campbell GL, Hills SL, Fischer M, Jacobson JA, Hoke CH, Hombach JM, et al. Estimated global incidence of Japanese encephalitis: a systematic review. Bull World Health Organ. 2011 Oct 1. 89(10):766-74E. [Medline]. [Full Text]. Hanna JN, Ritchie SA, Phillips DA, Shield J, Bailey MC, Mackenzie JS, et al. An outbreak of Japanese encephalitis in the Torres Strait, Australia, 1995. Med J Aust. 1996 Sep 2. 165(5):256-60. [Medline]. Baylis M, Barker CM, Caminade C, Joshi BR, Pant GR, Rayamajhi A, et al. Emergence or improved detection of Japanese encephalitis virus in the Himalayan highlands?. Trans R Soc Trop Med Hyg. 2016 Apr. 110(4):209-11. [Medline]. [Full Text]. Kumar R, Tripathi P, Singh S, Bannerji G. Clinical features in children hospitalized during the 2005 epidemic of Japanese encephalitis in Uttar Pradesh, India. Clin Infect Dis. 2006 Jul 15. 43(2):123-31. [Medline]. Li X, Cui S, Gao X, Wang H, Song M, Li M, et al. The Spatio-temporal Distribution of Japanese Encephalitis Cases in Different Age Groups in Mainland China, 2004 - 2014. PLoS Negl Trop Dis. 2016 Apr 6. 10(4):[Medline]. [Full Text]. WHO. Japanese Encephalitis Vaccines: WHO position paper, February 2015 - Recommendations. Vaccine. 2016 Jan 12. 34(3):302-3. [Medline]. Sarkari NB, Thacker AK, Barthwal SP, Mishra VK, Prapann S, Srivastava D, et al. Japanese encephalitis (JE) part II: 14 years' follow-up of survivors. J Neurol. 2012 Jan. 259 (1):58-69. [Medline]. Richman DD, Whitley RJ, Hayden FG. Clinical Virology. New York, NY: Churchill Livingstone; 1997. Bandyopadhyay D, Ganesan V, Choudhury C, Kar SS, Karmakar P, Choudhary V, et al. Two Uncommon Causes of Guillain-Barré Syndrome: Hepatitis E and Japanese Encephalitis. Case Rep Neurol Med. 2015. 2015:[Medline]. [Full Text]. Handique SK, Das RR, Saharia B, Das P, Buragohain R, Saikia P. Coinfection of Japanese encephalitis with neurocysticercosis: an imaging study. AJNR Am J Neuroradiol. 2008 Jan. 29(1):170-5. [Medline]. [Full Text]. CDC. 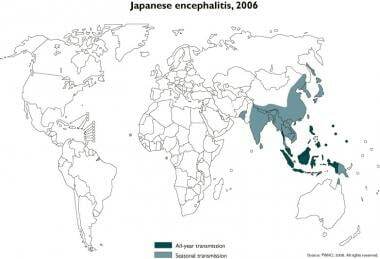 Japanese Encephalitis in Two Children — United States, 2010. MMWR Morb Mortal Wkly Rep. 2011 Mar 11. 60(9):276-8. [Medline]. [Full Text]. Suman V, Roy U, Panwar A, Raizada A. Japanese Encephalitis Complicated with Obstructive Hydrocephalus. J Clin Diagn Res. 2016 Feb. 10(20):OD18-20. [Medline]. [Full Text]. Chen WL, Liao MF, Chiang HL, Lin SK. A possible case of acute disseminated encephalomyelitis after Japanese encephalitis. Acta Neurol Taiwan. 2013 Dec. 22(4):169-73. [Medline]. [Full Text]. Verma R, Praharaj HN, Patil TB, Giri P. Acute transverse myelitis following Japanese encephalitis viral infection: an uncommon complication of a common disease. BMJ Case Rep. 2012 Sep 24. 2012:[Medline]. Solomon T, Thao LT, Dung NM, Kneen R, Hung NT, Nisalak A, et al. Rapid diagnosis of Japanese encephalitis by using an immunoglobulin M dot enzyme immunoassay. J Clin Microbiol. 1998 Jul. 36(7):2030-4. [Medline]. [Full Text]. Hoke CH Jr, Vaughn DW, Nisalak A, Intralawan P, Poolsuppasit S, Jongsawas V, et al. Effect of high-dose dexamethasone on the outcome of acute encephalitis due to Japanese encephalitis virus. J Infect Dis. 1992 Apr. 165(4):631-7. [Medline]. Harinasuta C, Nimmanitya S, Titsyakorn U. The effect of interferon-alpha A on two cases of Japanese encephalitis in Thailand. Southeast Asian J Trop Med Public Health. 1985 Jun. 16(2):332-6. [Medline]. Solomon T, Dung NM, Wills B, Kneen R, Gainsborough M, Diet TV, et al. Interferon alfa-2a in Japanese encephalitis: a randomised double-blind placebo-controlled trial. Lancet. 2003 Mar 8. 361(9360):821-6. [Medline]. Rayamajhi A, Nightingale S, Bhatta NK, Singh R, Kneen R, Ledger E, et al. A preliminary randomized double blind placebo-controlled trial of intravenous immunoglobulin for Japanese encephalitis in Nepal. PLoS One. 2015 Apr 17. 10(4):[Medline]. [Full Text]. Lee E, Pavy M, Young N, Freeman C, Lobigs M. Antiviral effect of the heparan sulfate mimetic, PI-88, against dengue and encephalitic flaviviruses. Antiviral Res. 2006 Jan. 69(1):31-8. [Medline]. Saxena SK, Mathur A, Srivastava RC. Inhibition of Japanese encephalitis virus infection by diethyldithiocarbamate is independent of its antioxidant potential. Antivir Chem Chemother. 2003 Mar. 14(2):91-8. [Medline]. Swarup V, Ghosh J, Mishra MK, Basu A. Novel strategy for treatment of Japanese encephalitis using arctigenin, a plant lignan. J Antimicrob Chemother. 2008 Mar. 61(3):679-88. [Medline]. Dutta K, Basu A. Use of minocycline in viral infections. Indian J Med Res. 2011 May. 133:467-70. [Medline]. [Full Text]. Mishra MK, Basu A. Minocycline neuroprotects, reduces microglial activation, inhibits caspase 3 induction, and viral replication following Japanese encephalitis. J Neurochem. 2008 Jun. 105(5):1582-95. [Medline]. [Full Text]. Kumar R, Basu A, Sinha S, Das M, Tripathi P, Jain A, et al. Role of oral Minocycline in acute encephalitis syndrome in India - a randomized controlled trial. BMC Infect Dis. 2016 Feb 4. 16(1):67. [Medline]. [Full Text]. Topno R, Khan SA, Chowdhury P, Mahanta J. Pharmacodynamics of aminoglycosides and tetracycline derivatives against Japanese encephalitis virus. Asian Pac J Trop Med. 2016 Mar. 9(3):241-6. [Medline]. [Full Text]. Harakuni T, Kohama H, Tadano M, et al. Mucosal vaccination approach against mosquito-borne Japanese encephalitis virus. Jpn J Infect Dis. 2009 Jan. 62(1):37-45. [Medline]. Yang DK, Kweon CH, Kim BH, Hwang IJ, Kang MI, So BJ, et al. The seroprevalence of Japanese encephalitis virus in goats raised in Korea. J Vet Sci. 2007 Jun. 8(2):197-9. [Medline]. [Full Text]. Schiøler KL, Samuel M, Wai KL. Vaccines for preventing Japanese encephalitis. Cochrane Database Syst Rev. 2007 Jul 18. CD004263. [Medline]. Yang SE, Pan MJ, Tseng HF, Liau MY. The efficacy of mouse-brain inactivated Nakayama strain Japanese encephalitis vaccine--results from 30 years experience in Taiwan. Vaccine. 2006 Mar 24. 24(14):2669-73. [Medline]. Connor BA, Bunn WB. The Changing Risk of Japanese Encephalitis for Business Travelers. Workplace Health Saf. 2015 Dec. 63 (12):568. [Medline]. Ravi V, Taly AB, Shankar SK, Shenoy PK, Desai A, Nagaraja D, et al. Association of Japanese encephalitis virus infection with Guillain-Barré syndrome in endemic areas of south India. Acta Neurol Scand. 1994 Jul. 90(1):67-72. [Medline]. Kuwayama M, Ito M, Takao S, Shimazu Y, Fukuda S, Miyazaki K, et al. Japanese encephalitis virus in meningitis patients, Japan. Emerg Infect Dis. 2005 Mar. 11(3):471-3. [Medline]. Chokephaibulkit K, Houillon G, Feroldi E, Bouckenooghe A. Safety and immunogenicity of live attenuated Japanese encephalitis chimeric virus vaccine (Imojev®) in children. Expert Rev Vaccines. 2015 Nov 20. [Medline]. Solomon T, Thao TT, Lewthwaite P, Ooi MH, Kneen R, Dung NM, et al. A cohort study to assess the new WHO Japanese encephalitis surveillance standards. Bull World Health Organ. 2008 Mar. 86(3):178-86. [Medline]. [Full Text]. Fischer M, Lindsey N, Staples JE, Hills S; Centers for Disease Control and Prevention (CDC). Japanese encephalitis vaccines: recommendations of the Advisory Committee on Immunization Practices (ACIP). MMWR Recomm Rep. 2010 May 12. 59:1-27. [Medline]. [Full Text]. Dwibedi B, Mohapatra N, Rathore SK, Panda M, Pati SS, Sabat J, et al. An outbreak of Japanese encephalitis after two decades in Odisha, India. Indian J Med Res. 2015 Dec. 142 Suppl:S30-2. [Medline]. [Full Text]. Burke DS, Nisalak A, Ussery MA, Laorakpongse T, Chantavibul S. Kinetics of IgM and IgG responses to Japanese encephalitis virus in human serum and cerebrospinal fluid. J Infect Dis. 1985 Jun. 151(6):1093-9. [Medline].